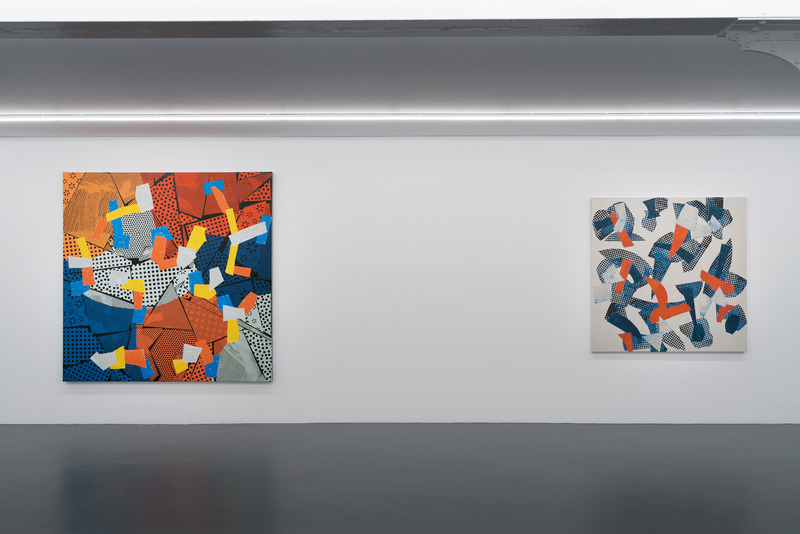 Xippas Gallery is pleased to present Something Else, a major exhibition of Yves Zurstrassen, that plays out to the rhythm of free jazz and explores the potential of abstract painting. The exhibition reunites, on the both floors of the gallery, a body of work carried out since 2014 till today. 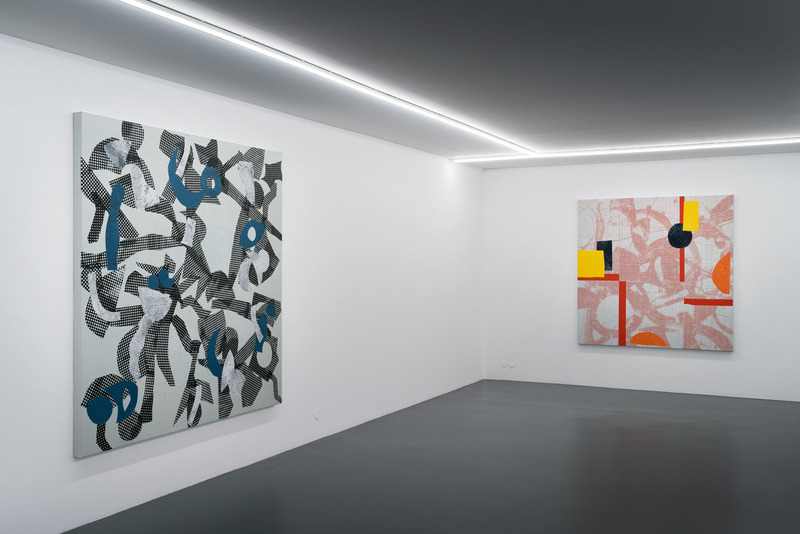 Although Yves Zurstrassen’s painting, forever in motion, has evolved throughout the years, there is something that remains intact: the desire to combine the expressive painterly gesture, which is intuitive and free, with calculated, precise, mathematical forms. 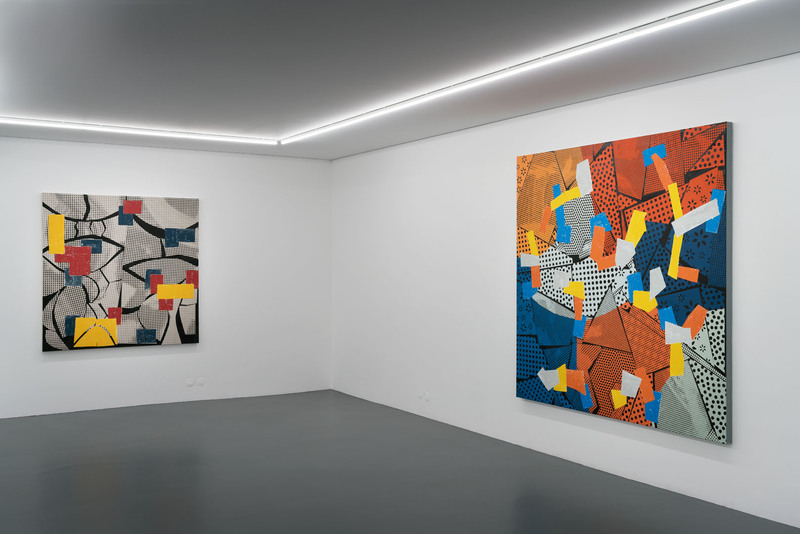 The latter re-emerge on the surface of the paintings, giving structure and introducing a regular or syncopated rhythm to the lyrical sum of the compositions. To say that these forms “re-emerge” is not merely a poetic turn of phrase. The creative process requires, or rather unfolds during, this very step. 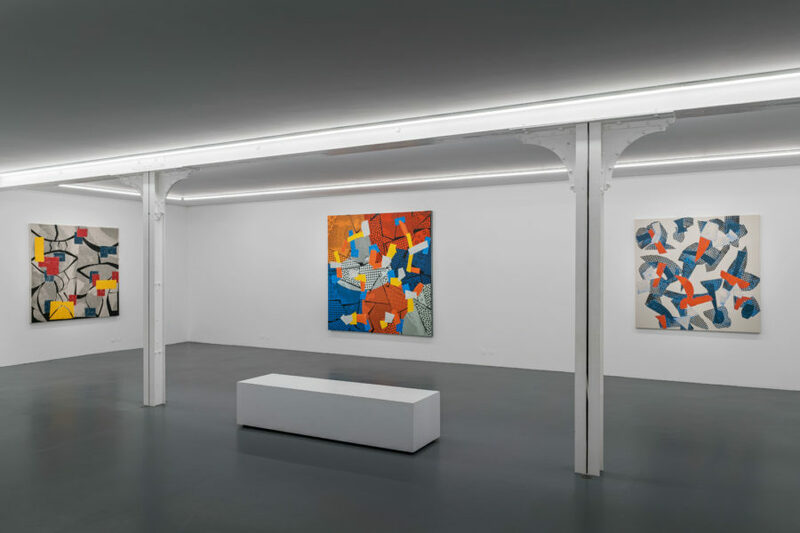 But before reaching the promised culmination, the paintings are built, stage by stage, act after act, while combining several techniques and revisiting those artistic practices – always with a view of deconstructing them – that wrote the history of abstraction in the 20th century. The pictorial adventure begins with the application of paint on the canvas, in order to create a unified background – a stable point, a monochrome, which functions as a stage that will only stay empty a short time, before the curtains open and the theatrical performance begins. Next, using collage, the real action starts. Stencils of blank newsprint, produced by a cutting machine connected to a computer, are disposed directly onto the fresh, wet paint of the background. These extremely fine membranes partially cover it in ornamental and repetitive shapes, labyrinthine yet precise, while multiplying rhythmic lines, narrative trajectories or, we might say, carefully arranged accidents, indispensable to reinforce the dramatic tension. What follows is a pause – a sort of intermission – which lasts until the paint has dried. This moment in the painterly construction is essential for the colours to remain pure and luminous, without being altered by coming into contact too quickly. We then move on to the second act, where the whole surface is covered over again, but this time with paint, until there are no empty spaces remaining. And yet this time, it is no longer a question of creating something uniform, or of returning to the monochromatic stage which the painting has already gone through. On the contrary, the paintbrush wanders freely over the surface, already covered in paint and rhythmed by the collages of fine paper, and covers it for a second time with rich pictorial matter, leaving behind the visible traces of its passage. The expressive gestures topple the previously meditated structure and hide it from view with thick, unpredictable lines. In theatre, such a scene, where everything is mixed up and nothing is clear, would be called a knot: the culminating point of the intrigue. We can therefore already predict that what will follow next is a final resolution of conflict which restores harmonious order to things. 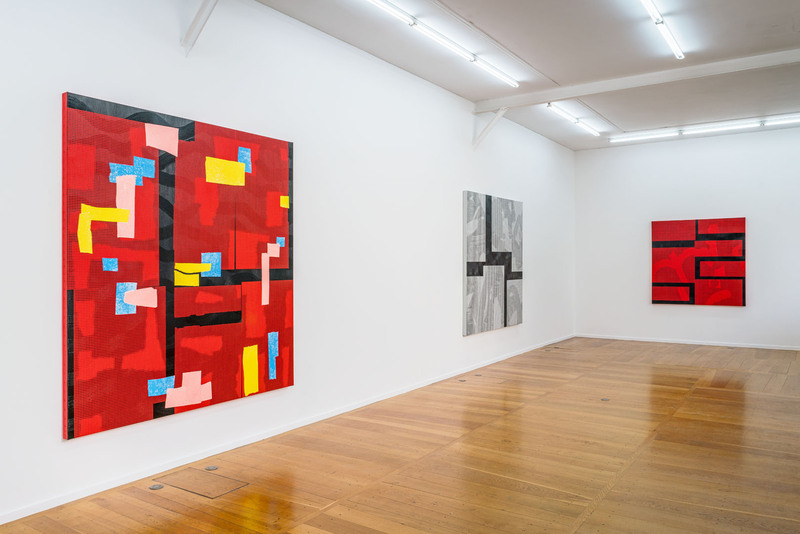 This all takes place thanks to a final incident: the stencils, first attached, then covered over with paint, are finally taken off from the surface, revealing the original colour beneath – red, black, white – like a window which, the moment it opens, discloses a fragmented view of what lies behind the facade. This stage is crucial: it not only brings to the surface the rhythmic forms of the background by inverting the relationship between “back” and “fore”, but also bears witness to the very process of creation of each piece. It becomes possible to infer all of the stages by which the painting has passed before it has stabilised itself in its current form, and thereby to undertake its archeological reading. 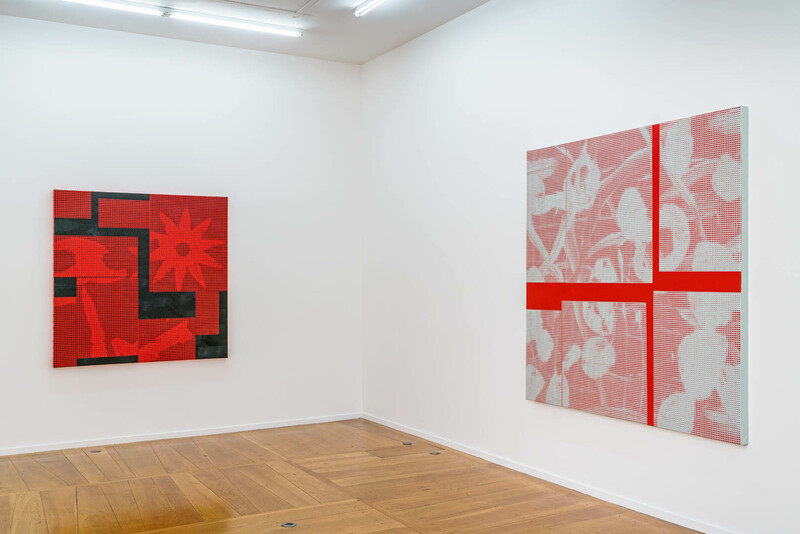 The more recent works – and especially the small and medium-sized pieces, which Yves Zurstrassen considers to be “research areas” – result from this exact procedure, and bring ornamental and vertiginous motifs to the surface of the paintings. The bigger recent canvases are part of a logic of evolution which only becomes visible in retrospect. However, this exploration of the past is not that of art history but of the artist’s own vocabulary which he often revisits. 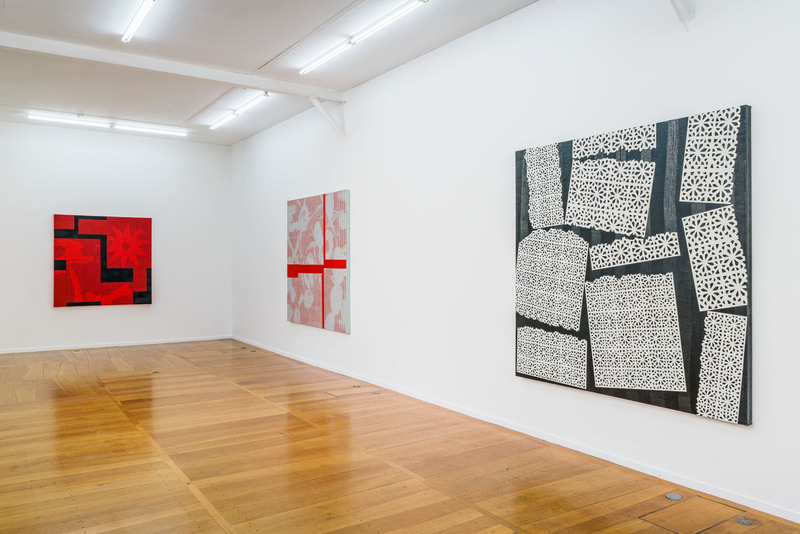 In these canvases, the use of stencils creates lyrical and expressive forms drawn from earlier paintings. 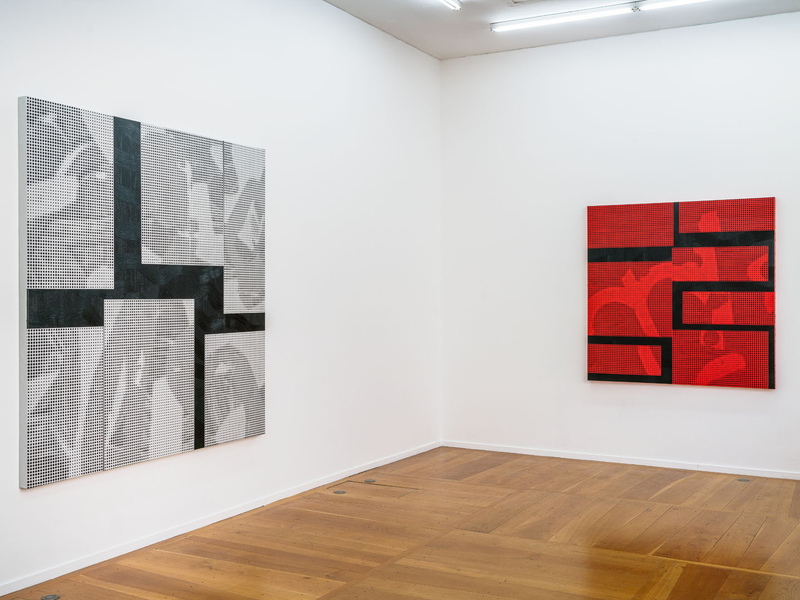 The latter, carefully filed in the artist’s personal archives, were first photographed, then their images were digitally treated before reappearing on new canvases, in different media and with different gestures: from paintings, they have been transformed into collages, whilst the expressivity of their forms has been deconstructed. And yet, this change of medium is only temporary, because for Yves Zurstrassen, collage remains a stage to be overcome. Literally – the stencils are only applied in order to laterbe taken off. Hence, old melodic motifs take on a second life in paint, exploring their own limits by way of these new rhythmic interpretations. Yves Zurstrassen’s painting is an activity, a process, a gesture, immobilised on the canvas, and condensing three space-times – intrigue, the development of action, and the dénouement – into a single moment, the present. Above all, it is rhythm which comes across in counterpoint, with freedom of improvisation. More precisely, it is the rhythms of free jazz which we recognise in the visual compositions of Yves Zurstrassen and which, by the way, accompany the artist whilst he paints. Yves Zurstrassen was born in 1956 in Liège, Belgium. He lives and works in Brussels. A catalogue with a text by Xavier Douroux was published in 2017 on the occasion of his exhibition at Xippas gallery in Geneva. © Xippas Galleries, Paris, France E.U.